Considering a typical scenario where there might exist a small phase offset between local oscillator between the transmitter and receiver. In such cases, it might be desirable to estimate and track the phase offset such that the performance of the receiver does not degrade. 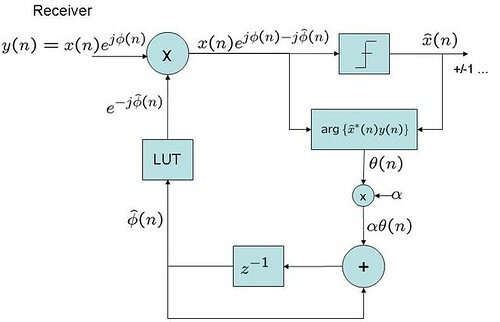 Typically, a first order phase locked loop which converges to is used for facilitating synchronous demodulation. The estimate from each sampling instant is accumulated to form the estimate . 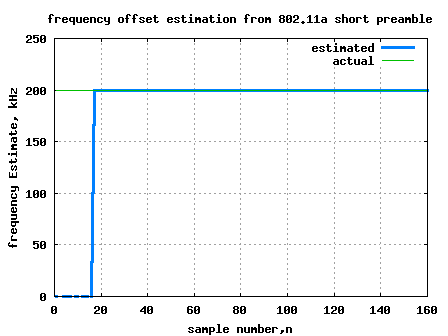 This estimated phase is removed from the received samples to generate . 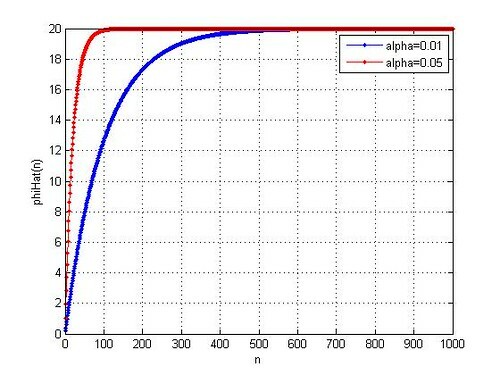 The parameter is a non-zero positive constant in the range controls the rate of convergence of the loop. Higher value of indicates faster convergence, but is more prone to noise effects. Lower value of is less noisy, but results in slower convergence. Figure 3: Convergence of for two values. i got it to work, but i still dont understand quite well what i said before. are you projecting an X axis or something like that? i really want to know. thank you. %al simular con e^jwt siempre quedara una parte representada en coord imaginarias, por lo k habria k hacer unas modificaciones para que se detecte cuando no sea error de fase y sea causa de la misma onda. % se puede representar un desfase cualquiera como e^j(wt+phi) ? it still wont work for angles above 90 degrees…. @Ananias: Was the phase constant in the sinusoidal input? Can this code be used to recover the carrier ? Carrier signal is in 1GHz range. @Dinu: For recovering the carrier, we might need a second order loop. Will write about it soon. Thanks fr the reply Krishna. In the previous comment by Venkat, he describes quite similar scenario to my program. How can I check the accurancy of the code? I have another question, I am working on low SNR environment. Does these phase lock loop work on low snr region? @Dinu: This piece of code does only phase tracking and not frequency tracking. I have not tried checking the performance in the low SNR region. 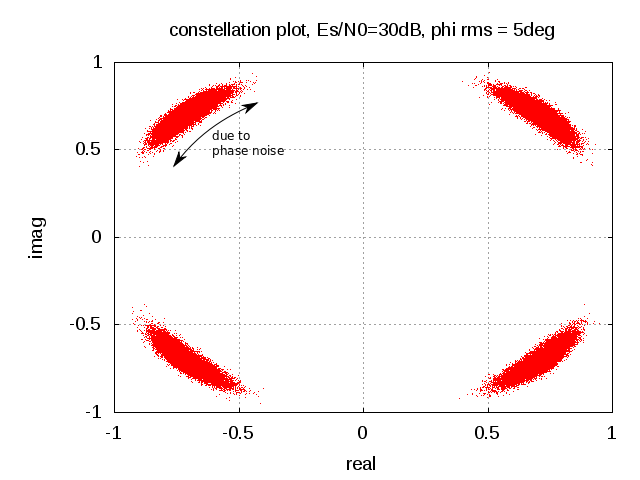 I have referred your example on first order PLL for constant phase tracking.It was very useful. But in the example a complex carrier is being used at the transmitter and receiver.Practically , when I use a cosine carrier at Tx. and cosine,sine carriers at Rx. (as in costas loop) , can the same loop filter be used ? I have tried to simulate the above situation in the following script but was unable to estimate the phase. Please help me………. @venkat: Does your transmit signal contain phase information? Did the code work in no noise case?